GUIDE VISITORS WITH DIGITAL WAYFINDING MAPS & DIRECTORIES! Installing a wayfinding open source software in your lobby is an excellent way to greet visitors. It’s the perfect opportunity to make a good first impression. Wayfinding displays are used in corporations, schools, exhibition centers, stadiums, shopping malls, transit stations, office buildings and other public venues. In fact, a well designed wayfinding system can help visitors navigate through any type of buildings or campus. Navori QL is compatible with any wayfinding content, whether it’s from a stand-alone software or interactive content created in HTML, HTML5 or Flash. 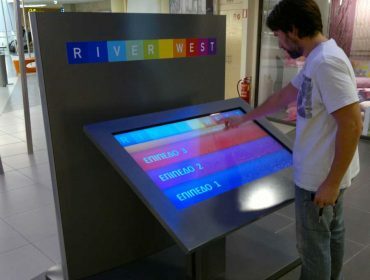 Interactive wayfinding maps can be triggered via a touch screen or using any type of sensor, RFID or keypad. • Use any type of interactive content or application. • Show your current location and guide you to your destination using 3D maps. • Display traditional digital signage content when idle. • Interface with external software and databases to update directories in real-time. QL works seamlessly with any custom interactive open source software like wayfinding maps and directories. Showcase of a traditional digital display combined with a way finding system used in malls, hotels and corporate environment.